NEW YORK (Reuters) - The rally in regional U.S. bank stocks that followed last month's election of Donald Trump may not be over, but investors may have to wait for policy to take shape for the massive move to extend further. The S&P 600 index of small-cap banks has surged more than 20 percent since Trump's surprise Nov. 8 victory, while their large-cap peers on the S&P 500 index have jumped over 17 percent. 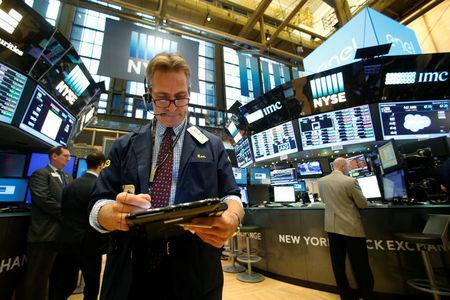 Investors booked profits on Friday, with the small-cap index down 0.8 percent and the larger banks dropping 1.1 percent. Smaller lenders could potentially add as much as 40 percent to their fourth-quarter 2017 earnings if Trump's promises of tax cuts and regulatory changes materialize, according to Sandler O' Neill analyst Brad Milsaps. Trump is scheduled to take office Jan. 20. His Treasury Secretary nominee, Steven Mnuchin, on Wednesday criticized the Dodd-Frank banking regulation act saying that it inhibited bank lending, potentially implying a willingness to try to change regulations to help boost that revenue source. Investors are betting that rising long-term interest rates, expected corporate tax cuts as well as lighter regulation will help banks under a Trump administration. "There's definitely more opportunity on the regional banking level," David Lebovitz, global market strategist at JPMorgan Asset Management. "When you go down in market capitalization you begin to insulate yourself from a lot of these external forces. Dollar strengthening is less of an issue." Bank profits depend largely on the spread between long- and short-term rates. The spread between benchmark U.S. 10-year Treasury notes and 2-year Treasuries has widened nearly 30 basis points since the U.S. presidential election, touching its highest in a year on Thursday. Adding to upward pressure on yields, the Federal Reserve is expected to raise overnight U.S. interest rates at its meeting on Dec. 13-14 by 25 basis points, the first hike in nearly a year. In relation to rising interest rates alone, Keefe, Bruyette & Woods boosted its operating earnings growth estimates for banks with assets of $50 billion or lower to 10 percent from 6 percent next year, and to 11 percent from 4 percent in 2018.